We are a member of Outdoors WA being the peak body in the state for outdoor education and recreation. A requirement of membership is unconditional acceptance and adherence to the Outdoors WA Code of Ethics and Code of Conduct. In West Australia the peak body for abseiling activities is Outdoors WA. The Western Australian Adventure Activity Standards have defined ratios of suitably qualified guides to participants on roping programs. We would not be prepared to exceed these ratios. 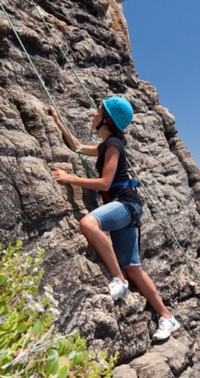 We provide at least the required number of qualified and experienced guides for abseiling and rock climbing programs. All lead guides will be appropriately registered with the National Outdoor Leader Registration Scheme. All of our guides have several years' experience in both technical roping skills and working with corporate, school and recreational groups. The Leeuwin-Naturaliste Ridge is part of the Leeuwin-Naturaliste National Park and the land manager for the caves and karst features is the Department of Environment and Conservation (DEC). All the caves have a specific ratio for instructors/leaders to participants through the DEC Permit System. We meet all requirements of these permit system. To run caving programs in the South West of Western Australia (with or without an abseiling component) you must hold a DEC Cave Trip Leader certification. All our caving leaders/instructors hold this qualification. In Western Australia the peak body for canoeing and kayaking is Australian Canoeing. This body has replaced the Board of Canoe Education. They recommend an instructor to participant ratio of 1:12 on flat water and 1:6 in Grade 2 moving water. We would not be prepared to exceed this recommendation and prefer a ratio of 1:10 on flat water. The Department of Transport is responsible for the licensing of canoes in West Australia. Canoes that are used for hire by commercial operators are required to be surveyed every year to confirm that they are in good condition. All life jackets and paddles are also checked. Our canoes are in current survey with the Department of Transport. All instructors are experienced not only in the technical paddling and rescue skills but also have experience on many different rivers.